This spring is blooming with special family events: an awards dinner, a family trail run, a junior prom, a graduation, and more to come. My nephew’s graduation from Swarthmore College this past Sunday might top the list, so far. I imagine, though, that if I could attend his twin brother’s graduation from Carlton College, it would tie for first place. We’ve known that Swarthmore is unique and special ever since my sister decided it would be her alma mater. We attended this year’s ceremony which, incidentally, has not changed much since my sister and brother –in-law graduated. Just as my mom, dad and I did 30 years ago, we all sat mesmerized by the inspirational and humble speeches. We learned and laughed so much that the 2+ hour ceremony seemed to take only a few minutes. I wish my mom could have been with us May 31, 2011 just as she was on May 30, 1981. She would have been beaming as Jordan, her grandson whose company she loved, received his diploma. She would have reveled in the legacy that my sister and brother-in-law created. And, she would love, as I do, the family bonding that takes place at such gatherings. That’s what it is all about anyway—the family coming together to celebrate an individual (super impressive one…. ), each other and the family dynamic. What celebrations do you have this spring? How do you manage to make sure all of the family feels important while celebrating individuals? What aspect of your celebration is unique and different from other family functions? What a spectacular night—then and now. I remember thinking about how pretty my dress was and planning how much time I would spend curling my hair. And, I loved my blue sandals! Really. Thirty years have certainly changed the look, but not the feeling. The girls going to last night’s junior prom looked like they walked right out of glamour magazines. They prepped for hours, but not at home—at salons. They sparkled from head to toe. This right of passage is timeless and touching. It’s hard to hold a camera steady while tearing up. On my way to take my daughter to the salon, I felt so fortunate to be with her. I realize that we are so lucky to have each other and be able to share these moments. I am lucky to have shared so many of my special events with my mom. Certainly, I wish my mom could be here to see her granddaughter on any ordinary day and especially on days such as this. I can’t even imagine how she would contain herself. Well, actually, I will imagine and that helps create a warm smile. Spring time is often prom time and a great opportunity to reflect on the past. 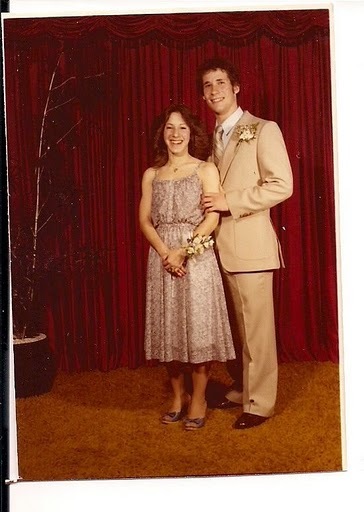 Did you go to your prom? Do you have a daughter primping for her prom? What feelings do these memories and moments inspire for you? It often seems that my own behavior or mispronunciation (Great Adventures post) mimics my mother’s. Yet in our recent family car ride, my very own daughter reminded me of my mother. In fact, I lectured her with almost the same speech my father gave my mom—as she applied make up on our way to visit relatives. We might have even been on the same part of the NJ Turnpike as mascara and eyeliner were applied. “It is not safe, don’t put that near your eye while we’re moving….” I recall my father being even more horrified than I was, worrying about my mother poking out her eye! But, my daughter took this make-up session to a new level—opening the window to dispose of the shavings while sharpening her eye pencil Crazy. Growing up, I thought this was more of a woman vs man issue. My mother was often late in getting ready and leaving the house. It made sense that she might have to finish her make-up in the car. I thought my father just did not understand a woman’s dependence on make-up and need to be perfectly coiffed before entering most social gatherings. Even my dad who worked for a major cosmetics company (Lipstick Tree post), did not empathize with a make-up obsession. But, of course that was not the case at all. “Use all the make-up you want in a stationary spot”, he should have said. And, that is exactly the message I gave my daughter on route to dinner in NYC. I must imagine that either you remember a similar make-up or car safety issue from either your mom or yourself. What was the transgression? Is it a mother’s job to teach us how to use make-up and when to apply it? How often do you apply make-up in the car? If driving, should the “no texting” law include “no make-up application”? 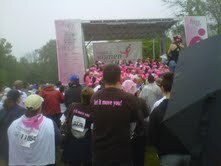 After today’s inspirational Susan G. Komen North Jersey Race for the Cure, I couldn’t wait to write this post. What a great, very pink day! The run through the South Mountain Reservation was beautiful and invigorating despite the drizzle. But, the most captivating part was the crowd remembering women who lost their cancer battle and celebrating those who survive. A speaker, Hoda, a cohost on the Today Show gave an inspirational speech, reminding us that each day has a huge and meaningful impact on our lives. She convinced me that any change I want to make in my life starts with what I do today, tomorrow, the next day…. My mother reacted to cancer the way these inspirational women did—she decided to not be scared and to fight with both physical and emotional strength. She read books about using emotional tools to heal and she found experimental treatment to try as a last resort. When she (or more accurately, the doctors) thought she was cured, she tried to move on and actually moved to a new state, starting over. At the very least, I wish my mom could have walked or run in a race to the cure (isn’t that what she did during the years she was sick, anyway). But, rather than dwell on that obvious feeling, today I felt the power of the people at the race. And, I wonder what charities you have supported with, not just money, but energy? I am about to use one of my mother’s ingenious methods for making sure that my family shared prized items. She used it for dessert, yet I am going to adapt it to lox! Until my mother implemented this solution, we struggled with arguments over who had more of my mom’s Wacky Cake. The cake is a delicious and light chocolate cake that is made with a wacky ingredient (worth a separate blog entry in the future) and we would finish almost the whole cake after dinner. That is where the problem came in. Sometimes my sister, mother and I would not choose to eat much cake after dinner, but my father always had extra dessert room. So, when the I was about ten, my mother started cutting the cake into 4 pieces. Thus, we could eat our quarter any time we wanted. There was no pressure to finish our assigned piece, no more reason to hurry before my father finished every crumb. We do have similar issues in my family now. Usually it all works out, but the struggle ensues. However, the star, most wanted food is lox! It seems that as soon as I open the package, it’s almost all gone. I have observed one or two members of our family taking piece after piece, without obvious regard for others who might want just a little lox sandwich? I am often afraid that if we don’t each eat lox right away, we won’t get any at all. So, next time I buy a package of lox, I will divide it into 4 portions. Each of us will be allowed to eat from our portion only, but with an “expiration date” so that all of the portions are consumed before they spoil! I wish I could tell my mom how her wacky cake procedure will help eliminate my family’s stressful lox consumption! What unique and useful tips/tricks have you adopted from your mom?